We offer a bag for every occasion and a product for every need. Whether you want basic bags, colorful bags, or specialty designs, you’ll find a style here that is attractive, affordable, and strong enough to handle your every demand. Here is an introduction to a few of our most popular bags so you can find the right bag for you. Our best-selling 1BAG Standard bag is our most popular product. It’s made from full 90 GSM NWPP fabric and is tested for 1500 lifts and drops, enough to last up to two years of regular use. Available for about a buck even with low minimums, this is the bag that sets the standard for what a good reusable bag should be. Four-color laminated bags offer edge to edge graphics to generate excitement and interest for custom grocery bags, shopping bags, and promotional bags. These bags are extra durable with 120 GSM fabric and a wipe clean surface. Very affordable in higher quantities, these bags are designed to show off your graphics and your brand in a memorable way. 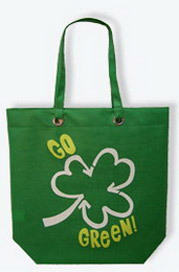 Recycled bags with laminated graphics are the gold standard in eco-friendly reusable shopping bags. Made from 85% post-consumer polyethylene derived from water bottles, these bags are recycled and reusable, helping to close the loop on plastic products. Insulated bags for hot and cold foods are a category in themselves. Ours have triple layer construction and zip fully closed for best insulation. Our new design shows your branding on back and front when the bag is folded and in use. Wine bags and small lunch-sized bags along with other specialty bags round out our collection of bags for a full variety of bags. If you don’t see what you need, contact us and tell us what you have in mind. We can customize a bag that fits you. See the menu at the left to view all our most popular products, or contact us for a catalog.